Take advantage of fresh berry season with this delicious Summer Strawberry Salad. 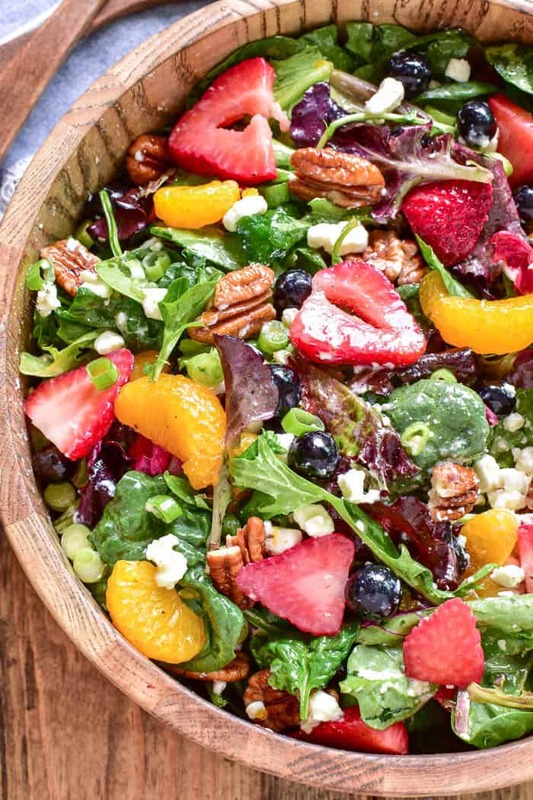 Loaded with fresh strawberries, blueberries, mandarin oranges, pecans, goat cheese, and sparkling orange vinaigrette, this salad is the perfect balance of savory, sweet, crunchy, creamy, and YUMMY! 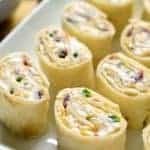 It makes the perfect side dish for any meal and can be topped with chicken or shrimp for a satisfying main dish. Once you taste the amazing flavors in this Summer Strawberry Salad you’ll never eat a boring salad again! It’s no secret that I’m all about the salads. I love them any way I can get them, and I literally eat them daily. Of course I have my favorites, like this Blueberry Feta Salad and this Pineapple Crunch Salad (trust me…you have to try it! ), but the truth is I’ve never met a salad I didn’t like. And when it comes to summer, I especially love salads with fresh fruit! 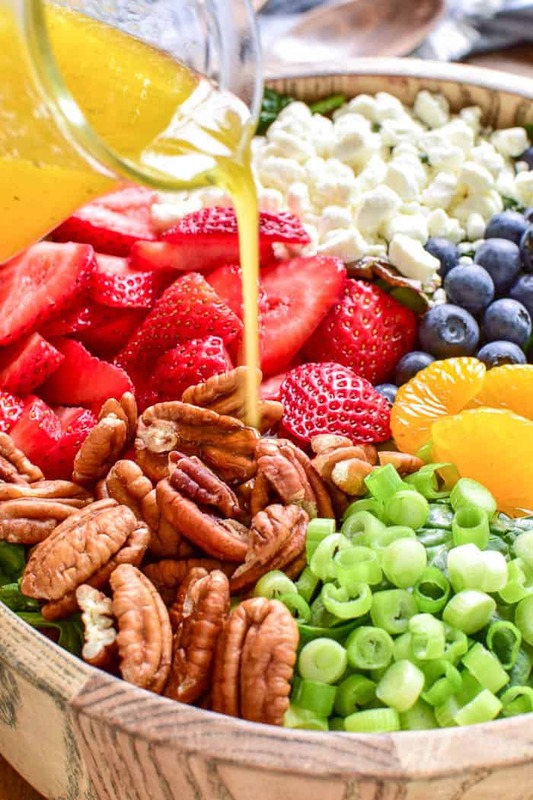 Because the fresh fruit selection is amazing…and the savory-sweet combination of fruit + cheese + nuts is one of my favorites. And when it comes to fruit? Well, we all know that strawberries on salads can’t be beat. And there are so many different ways to mix it up. 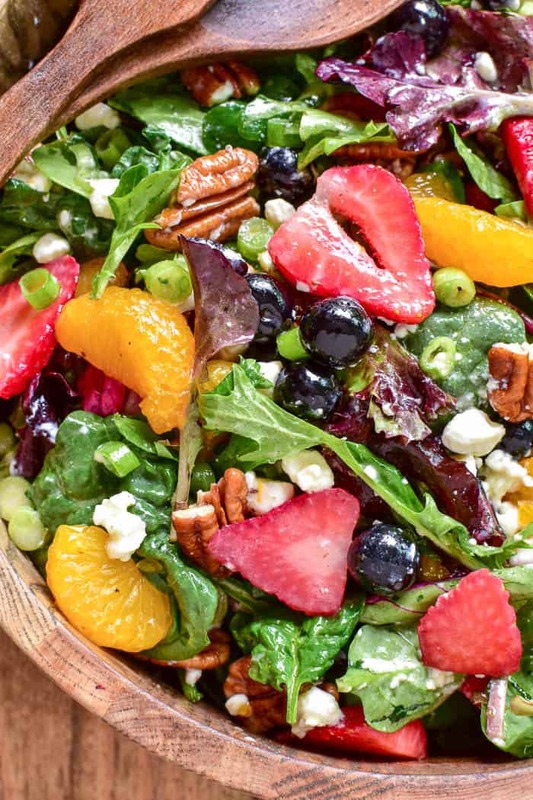 Like this Strawberry Bacon Blue Cheese Salad or Strawberry Spinach Salad with Goat Cheese & Pistachios….or….this Summer Strawberry Salad! 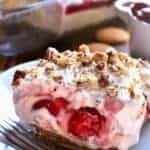 HOW DO YOU MAKE STRAWBERRY SALAD? Start with 8 oz. of spinach or your favorite mixed greens. Add 1 cup sliced strawberries, 1/2 c. fresh blueberries, and 1/2 c. mandarin oranges. 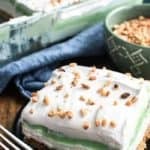 Top with 1/2 c. pecans, 3.5 oz. crumbled goat cheese, and 2 Tbsp. green onions. Prepare dressing, pour over salad, and toss to combine. 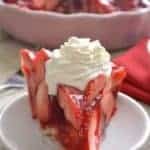 HOW DO YOU MAKE DRESSING FOR STRAWBERRY SALAD? In a small jar with a lid, combine 1/2 c. sparkling orange juice, 3 Tbsp. olive oil, 2 Tbsp. white balsamic vinegar, 1/2 Tbsp. honey, 1/4 tsp. salt, and 1/8 tsp. pepper. Shake well. WHAT FRUITS DO YOU ADD TO STRAWBERRY SALAD? Strawberry Salad can be made with just strawberries or with any other fruits you like. 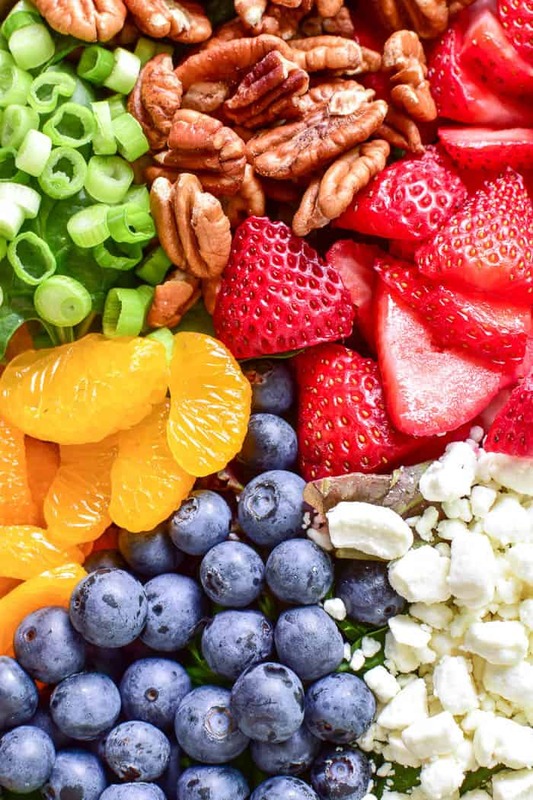 For this Summer Strawberry Salad I added blueberries and mandarin oranges, but you could also add mango, pineapple, raspberries, blackberries, or kiwi. WHAT OTHER TOPPINGS DO YOU ADD TO STRAWBERRY SALAD? There are many different options when it comes to Strawberry Salad. 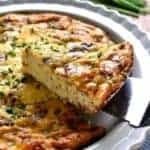 I usually add some type of cheese (goat, feta, or blue cheese), some type of nuts (pecans, almonds, pistachios, or walnuts), and sliced red or green onions. The thing I love most about this Summer Strawberry Salad, aside from how GORGEOUS it is, is the fact that it works equally well as a main dish or side dish. 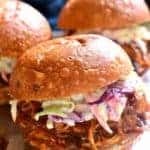 It makes a perfect light lunch, and for a more substantial meal you can always add grilled chicken, shrimp, or even salmon. And it would make a great addition to any summer picnic or party, too! 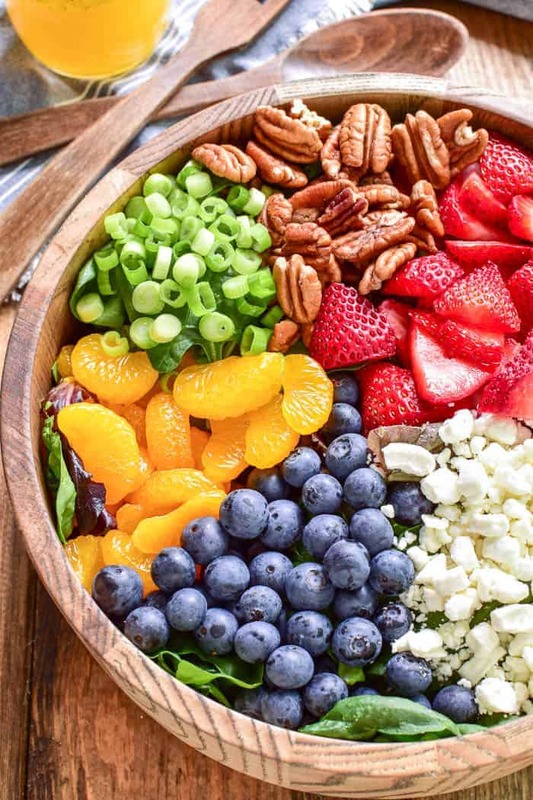 Between the fresh fruit, the pecans, and the goat cheese, it’s not only delicious, but also incredibly satisfying. 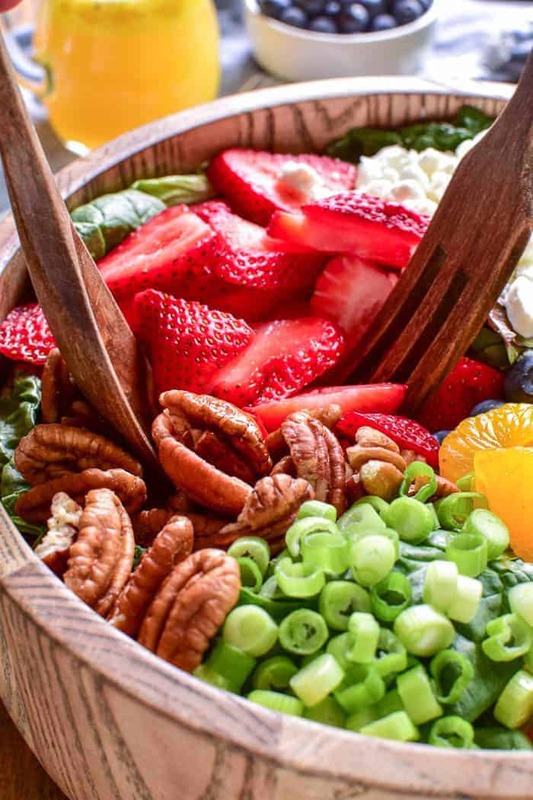 And I’m telling you….everyone LOVES a good strawberry salad! CAN YOU MAKE A STRAWBERRY SALAD IN ADVANCE? Absolutely! 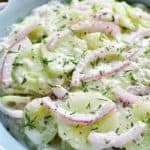 You can easily make this salad in advance, cover it tightly, and simply wait to add the dressing until you are ready to serve it. HOW WELL DOES STRAWBERRY SALAD KEEP? Once you add the dressing, you’ll want to eat the salad within the same day. The good news is this salad will be such a hit, there won’t likely be much leftover. Combine salad ingredients in a large serving bowl. Combine dressing ingredients in a small jar with a lid. Shake well. Pour over salad immediately before serving. What can be used as a sub for the sparkling orange juice, it’s not available in my area? Try some OJ mixed with a carbonated water like LaCroix. This looks so tasty and healthy I cannot wait to try it! 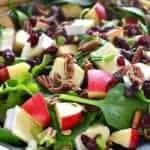 thank you for putting all of these ingredients together in a perfect summer salad, wow, lot of anti-oxidant power too, nice! I love a good strawberry salad! Oh I need to try this ASAP!!! Looks so vibrant and delicious!!! YUM, this looks incredible! Perfect for Summer! I have to make this salad asap! It looks so good! Love all those fresh flavors! SO yummy! 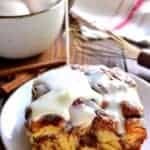 This dish is very delicious and attractive, I want to try it, thank you for sharing. 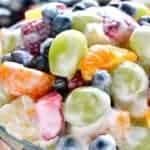 Strawberry salad is delicious, with many different fruits. Looks very attractive. I really like this dish.